Touch Screen Panel – You will find all your preference setting for your theme color, sounds, sleep mode and tutorials here. Cords – your machine cord can be tucked into the designed channel on the back bottom of the machine. Storage tray – An open storage tray for small items such as your sketch pens, weeding tool or whatever you chose to put in the tray. Built-in Blade Adjustor – I honestly didn’t know the reason for this slot until I finally used a ratchet blade. I have always used the AutoBlade and allowed the machine to adjust the blade. If you need to use the built-in blade adjustor you insert the blade and then use a twisting motion to adjust to the desired setting. Should you need to adjust an autoblade for any reason you will insert the blade followed by an up-and-down plunging action (like the machine normally does for you) to adjust to the desired setting. Adjustable spring-loaded rollers – allows you to adjust the main roller shaft to cut various media sizes. Dual Carriage – each tool has a colored circle on top (one is red one is blue). You will insert your tool (such as an autoblade or sketch pen) into the corresponding tool holders assigned in your “send panel”. This allows out to sketch and cut at the same time. Pull-out Storage drawer – A little drawer for small tools such as a weeding hook or tweezers. 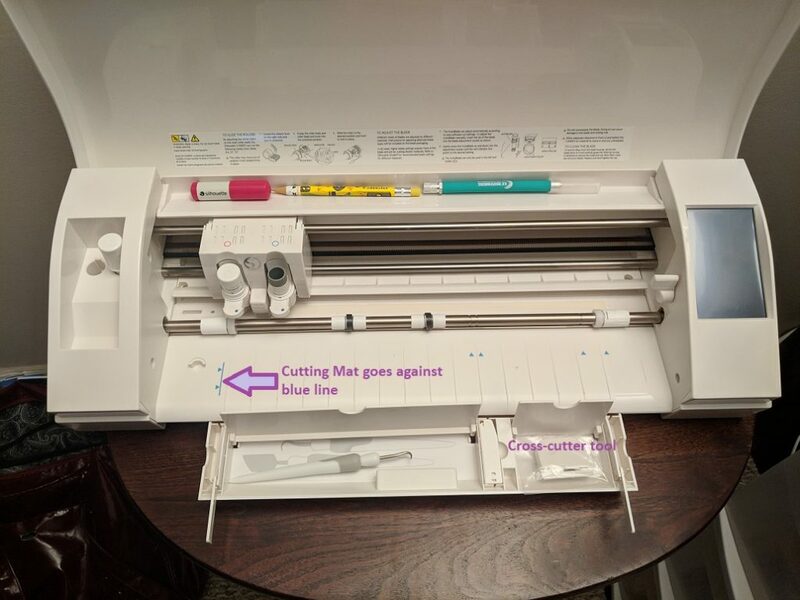 Mat cutting guide – put edge of your cutting matt next to blue line. Fold-out support arms – Helps stabilize your cutting mat. Can be used with either the 12×24 or 12×12 mat. Cross-cutter tool – Great for using on long pieces of or with a roll of vinyl. Put cutter into the track attached directly to the back of machine to cut in between jobs without out unloading the vinyl when not using a mat. Saving to and Cutting from a USB device – you and save your finalized project from the computer to a USB device; insert into USB slot on side of machine and cut directly from the Silhouette without a computer.